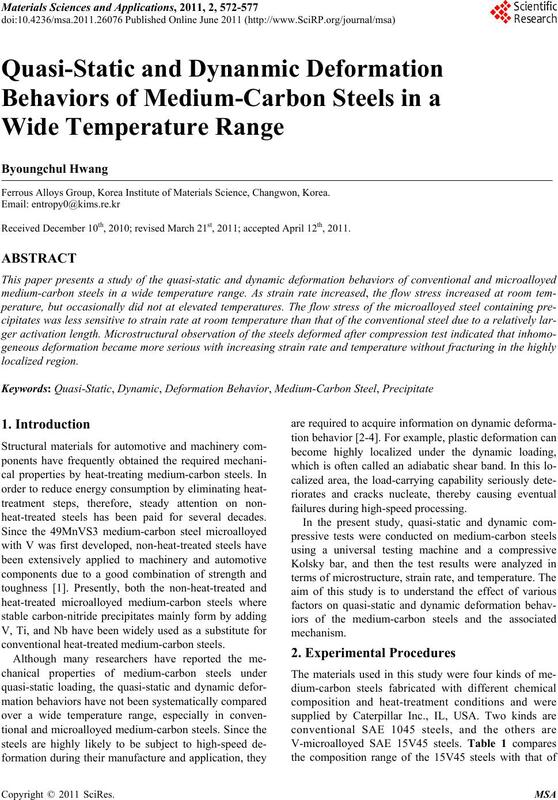 Ferrous Alloys Group, Korea Institute of Materials Science, Changwon, Korea. 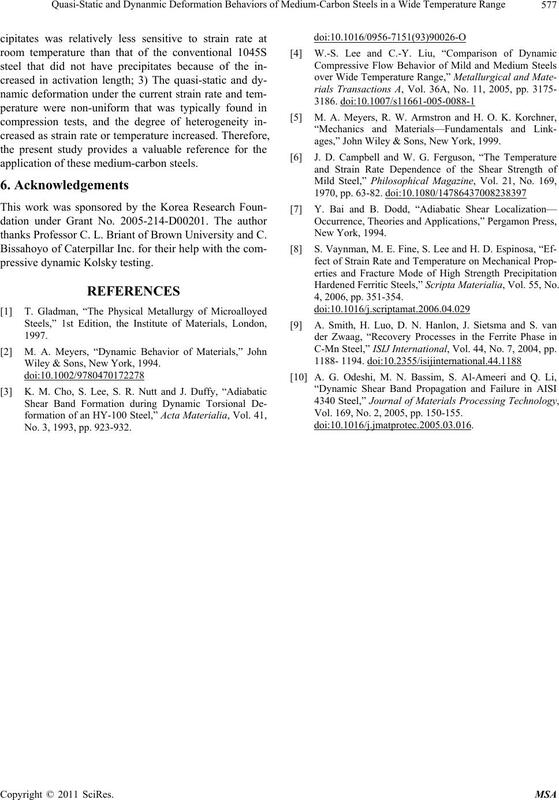 Received December 10th, 2010; revised March 21st, 2011; accepted April 12th, 2011.
heat-treated steels has been paid for several decades. failures during hi g h-speed processing . Q & T and austempering heat-treatments, respectively. friction and ensure a flat surface. after deformation by an optical microscope. microalloyed0 (SAE 15V45) medium-crabon steels (wt%). 10V 4 5S steels. Arrows indicate MnS inclusions. Nita l e t c h ed. than the conventional 1045 steels. 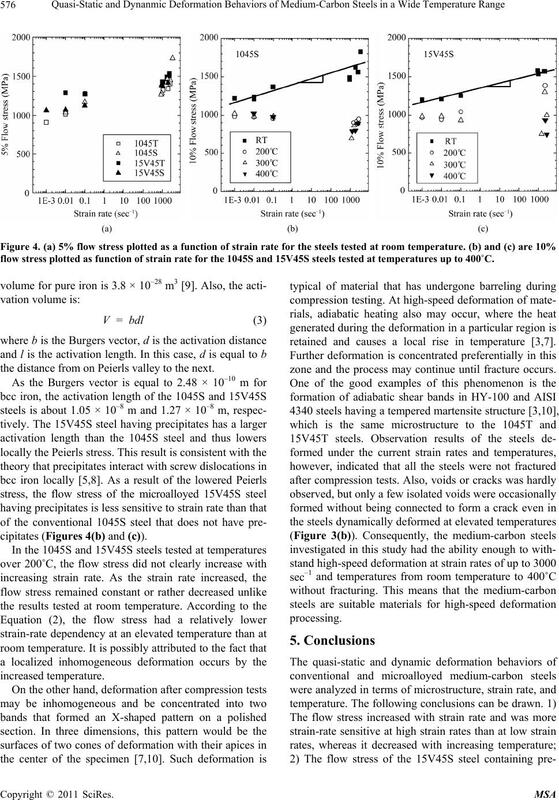 from room temperature to 400˚C. ring during dy namic loading . body-centere d cubi c ( bcc) m a t eri al s.
steel dynamically deformed at an elevated temperature. heavily deformed region (Figure 3(b)). distorted MnS inclusion and the for m ation of voids. 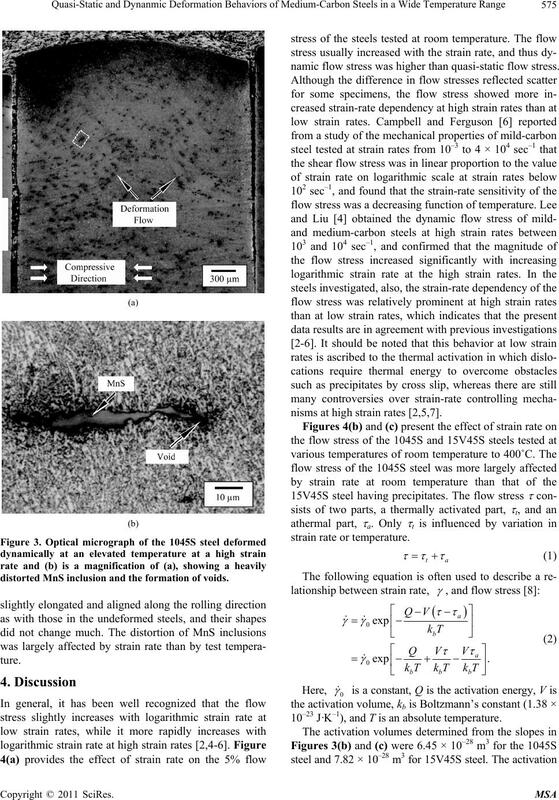 namic flow stress was higher than quasi-static flow stress. nisms at high strain rates [2,5,7]. 10–23 J·K–1), and T is an absolute temperature. 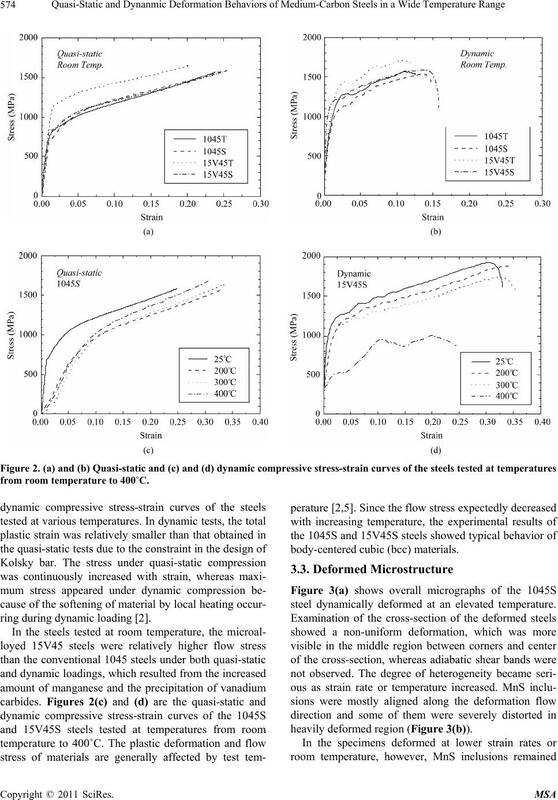 flow stress plotted as function of strain rate for the 1045S and 15V45S steels tested at temperatures up to 400˚C. the distance from on Peierls valley to the next. cipitates (Figures 4(b) and (c)). retained and causes a local rise in temperature [3,7]. zone and the process may continue until fracture occurs. application of these medium-carbon steels. thanks Professor C. L. Briant of Brown University and C.
Wiley & Sons, New York, 1994. No. 3, 1993, pp. 923-932.
ages,” John Wiley & Sons, New York, 1999. 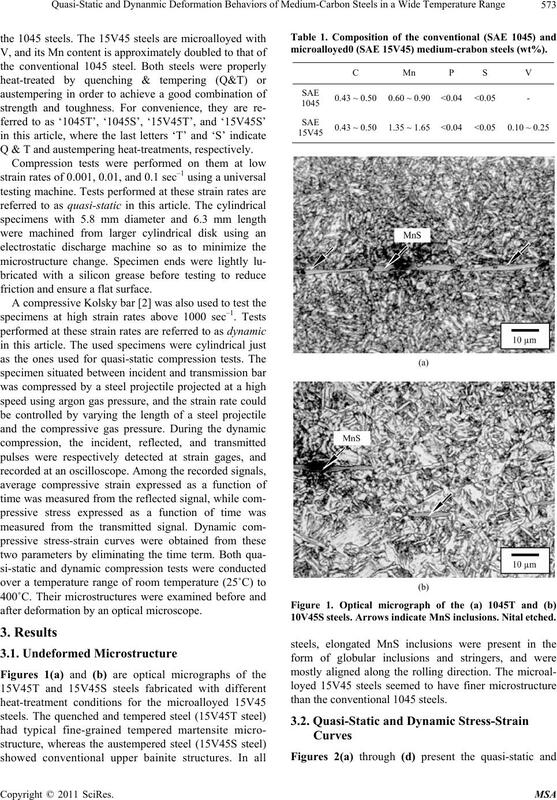 Hardened Ferritic Steels,” Scripta Materialia, Vol. 55, No. C-Mn Steel,” ISIJ International, Vol. 44, No. 7, 2004, pp. Vol. 169, No. 2, 2005, pp. 150-155.